Keith Jacobshagen was born in Wichita, Kansas, in 1941. Trained as a graphic designer and illustrator at the Kansas City Art Institute, he worked in the Contemporary Design Department of HallMark Card in Kansas City, Missouri, after graduation. In 1966 he was accepted into the MFA program at the University of Kansas, met Robert Sudlow, and began painting the landscape. 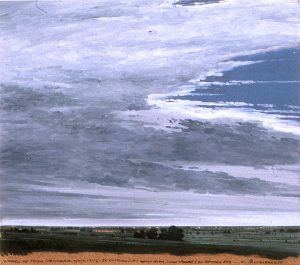 Jacobshagen has been painting the light and space of the Midwestern plains for thirty-two years. Since moving to Nebraska in 1968, he has concentrated on the landscape within a sixty-mile radius of Lincoln. Working partly in the field and partly in the studio, he paints images that visually define the vastness and light that are a part of the flatlanders’ spirit and experience. Jacobshagen’s work has been shown in galleries and museums throughout the United States. Since 1968 he has had sixty-three one-person exhibitions, including shows in New York, Chicago, and San Francisco. His work is included in many public, corporate, and private collections throughout the country.